As a living plant museum, there is so much to take in at the U.S. Botanic Garden! Consider a guided tour to learn more about the Garden's plants or collections. Free 45-minute highlight tours of the U.S. Botanic Garden Conservatory may be available on the day of your visit. Please check at the Visitor Information Desk upon your arrival. Tours on specialized topics or temporary exhibits are scheduled seasonally. Please check our calendar of events to see what may be available as you plan your visit. Groups of 10 to 15 adults may reserve a free 45-minute guided tour of the Conservatory at 10:30 a.m. or 1:30 p.m. Monday through Friday. Reservations must be made at least four weeks in advance. To arrange a group tour, please email usbgtours@aoc.gov or call (202) 226-2055. Due to high visitation and traffic flow throughout the Garden, no group tours are scheduled during the Cherry Blossom Festival, National Peace Officer's Memorial (May 15th), days immediately preceding and following Independence Day, and Veteran's Day through the end of the USBG's holiday show Season's Greenings (end date for Season's Greenings is the Sunday following New Year's Day). However, groups are more than welcome to visit the Garden during this time. 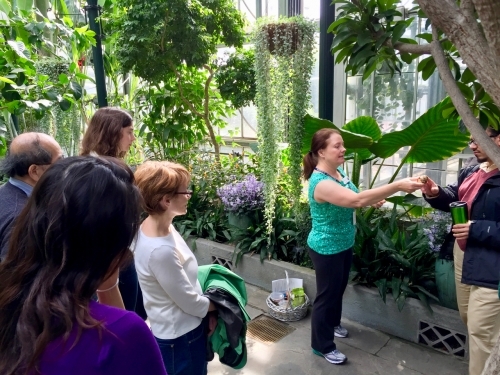 Due to the group-size limitations and the in-depth nature of our tours, the U.S. Botanic Garden does not offer tours for children or school groups. Please visit our Teachers section for more information about planning a trip to the USBG, including age-appropriate activities. Use your cell phone to learn more about the gardens and plants at the U.S. Botanic Garden. To get started, call (202) 730-9303 or visit www.usbg.oncell.com. Enter a stop number to hear a message about the Conservatory or National Garden. You may hang up and redial the tour at any time. During the tour, you can control the audio by pressing 1 to rewind the recording, 2 to pause/play the recording or press # to skip the recording. Normal fees apply to your call. Smartphone users can stream audio tour stops by visiting www.usbg.oncell.com.